Prudence, circumspection; also and especially treason, dissimulation, roguery, corruption. Concealment, disguise, policy, fear, unreasoned caution. It is further a card which is understood quite incorrectly when it is connected with the idea of occult isolation, as the protection of personal magnetism against admixture. This is one of the frivolous renderings which we owe to Éliphas Lévi. It has been adopted by the French Order of Martinism and some of us have heard a great deal of the Silent and Unknown Philosophy enveloped by his mantle from the knowledge of the profane. In true Martinism, the significance of the term Philosophe inconnu was of another order. It did not refer to the intended concealment of the Instituted Mysteries, much less of their substitutes, but–like the card itself–to the truth that the Divine Mysteries secure their own protection from those who are unprepared. 9. The Hermit, as he is termed in common parlance, stands next on the list; he is also the Capuchin, and in more philosophical language the Sage. He is said to be in search of that Truth which is located far off in the sequence, and of justice which has preceded him on the way. But this is a card of attainment, as we shall see later, rather than a card of quest. It is said also that his lantern contains the Light of Occult Science and that his staff is a Magic Wand. These interpretations are comparable in every respect to the divinatory and fortune-telling meanings with which I shall have to deal in their turn. The diabolism of both is that they are true after their own manner, but that they miss all the high things to which the Greater Arcana should be allocated. It is as if a man who knows in his heart that all roads lead to the heights, and that God is at the great height of all, should choose the way of perdition or the way of folly as the path of his own attainment. Éliphas Lévi has allocated this card to Prudence, but in so doing he has been actuated by the wish to fill a gap which would otherwise occur in the symbolism. The four cardinal virtues are necessary to an idealogical sequence like the Trumps Major, but they must not be taken only in that first sense which exists for the use and consolation of him who in these days of halfpenny journalism is called the man in the street. In their proper understanding they are the correlatives of the counsels of perfection when these have been similarly re-expressed, and they read as follows: (a) Transcendental justice, the counter-equilibrium of the scales, when they have been overweighted so that they dip heavily on the side of God. The corresponding counsel is to use loaded dice when you play for high stakes with Diabolus. The axiom is Aut Deus, aut nihil. (b) Divine Ecstacy, as a counterpoise to something called Temperance, the sign of which is, I believe, the extinction of lights in the tavern. The corresponding counsel is to drink only of new wine in the Kingdom of the Father, because God is all in all. The axiom is that man being a reasonable being must get intoxicated with God; the imputed case in point is Spinoza. (c) The state of Royal Fortitude, which is the state of a Tower of Ivory and a House of Gold, but it is God and not the man who has become Turris fortitudinis a facie inimici, and out of that House the enemy has been cast. The corresponding counsel is that a man must not spare himself even in the presence of death, but he must be certain that his sacrifice shall be-of any open course-the best that will ensure his end. The axiom is that the strength which is raised to such a degree that a man dares lose himself shall shew him how God is found, and as to such refuge–dare therefore and learn. (d) Prudence is the economy which follows the line of least resistance, that the soul may get back whence it came. It is a doctrine of divine parsimony and conservation of energy, because of the stress, the terror and the manifest impertinences of this life. The corresponding counsel is that true prudence is concerned with the one thing needful, and the axiom is: Waste not, want not. The conclusion of the whole matter is a business proposition founded on the law of exchange: You cannot help getting what you seek in respect of the things that are Divine: it is the law of supply and demand. I have mentioned these few matters at this point for two simple reasons: (a) because in proportion to the impartiality of the mind it seems sometimes more difficult to determine whether it is vice or vulgarity which lays waste the present world more piteously; (b) because in order to remedy the imperfections of the old notions it is highly needful, on occasion, to empty terms and phrases of their accepted significance, that they may receive a new and more adequate meaning. The Hermit – Prudence, Caution, Deliberation. The Hermit – An old and bearded man wrapped in a mantle, and with his head covered with a cowl, bearing in his right hand the lantern of occult science, while in his left he holds his magic wand half hidden beneath his cloak. He is Prudence. Papus: “Humanity fulfilling the function of God the Holy Spirit. The human creative force.” Indeed this is clearly Sagittarius for every astrologer. The author might have mentioned in the same line that the Hierophant (Leo) represents God the Son. The Hebrew letter “Thet represents a roof and suggests the idea of safety and protection . . . protection ensured by wisdom.” The astrologer says: the Ninth house is the house of the Master–idea of wisdom and protection in one; the Master in fact shields his disciples like a roof . . . in some way. The sign is that of thought-power, creative mind, idealism, which throw their own light on the things below, and consequently the Sagittarian is remarkable for always seeing things in his own light and trying to throw light on things in order to instruct other people. He is the eternal traveller, the indefatigable walker. And mentally he is always more or less lonely. All this is very distinctly symbolised in the card of the Hermit, which stands for ideas, perspectives, spiritual or moral influences and for light thrown upon the objects of this earth-life. In divination it stands for teachers, legal authorities, advisers and guides, and with the guiding principles in everything and questions, in relation to the querent. But above all it is his own idealism, etc. The direction in which his thoughts are running. 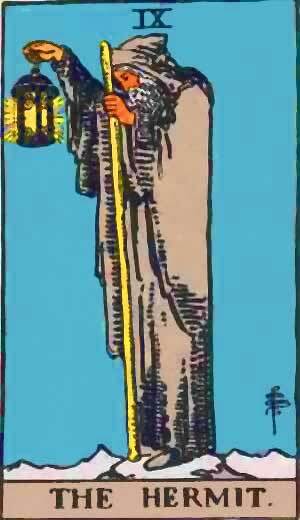 In the older cards the Hermit is shielding his light on one side with his mantle. This may be indicative of the habit of Sagittarians to evade and disarm contradiction beforehand, knowing by intuition the power of darkness. He is leaning on the staff of knowledge with regard to earthy matters. 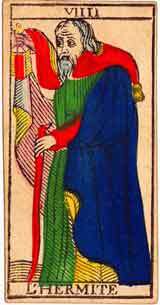 Waite is perfectly right in saying, that “Prudence is the least of its meanings and the most negligible.” Some authors (Mathers) held this card to be the symbol of ‘prudence,’ but indeed the Sagittarian is not very famous for this virtue, though the card is truly Sagittarian and nothing else. This is again proved by the striking explanation of Waite: “His beacon intimates that ‘where I am, you also may be. '” This is the stereotyped way in which a Sagittarian thinks. Corresponds to Yod and the sign Virgo. In its deeper occult meaning this card is closely connected with alchemical symbolism, through the rulership of Mercury in Virgo. Light and guidance from higher realms. Aid from superiors and inferiors. Good for Health. The Querant will suffer from misunderstanding and isolation; may expect active opposition from superiors and inferiors; may have to engage in unpleasant or menial occupations; and will be in danger of illness. More information on The Hermit Tarot card. This entry was posted in Tarot, Runes and Divination and tagged astrologer, darkness, earth, heart, intuition, love, science, stress, the hermit, wisdom. Bookmark the permalink.